Te Ao Mārama in the Māori world depicts the tangible and intangible, the spiritual and earthly realms. At another level it can also be described as the world of insight, experience and enlightenment. The pou (post) structure normally located as the central point in the wharenui (traditional meeting house) symbolises the intangible, interconnecting space that houses the physical and spiritual realms. This providing of an ‘in-between space’ between realms was central to the concepts behind TEZA as a public commons space. ‘Te Ao Mārama’ was installed in the centre of the TEZA site to help facilitate people being welcomed, embraced and encouraged to share. 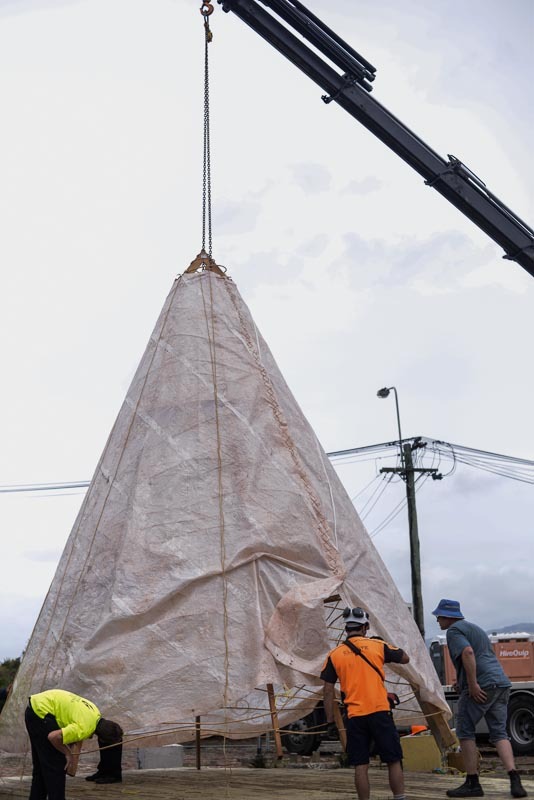 The structure was built over the week, involving collaboration with artists and the community (at one point on its side ‘undressed’ it resembled a Hïnaki or giant eel-catcher associated traditionally with the nearby river). It was clothed in a dress of muka-enhanced bio-plastic. Barlow held bioplastic and muka workshops, and with Waikerepuru met with local youth groups. ‘Te Ao Mārama’ was illuminated in the evenings reflecting new learnings gained and shared. At the time of writing the work was still in use on site. Te Urutahi Waikerepuru from Taranaki has experience in developing indigenous, cross-cultural and inter-disciplinary networks to establish respectful relationships that build rewarding and sustainable community partnerships. A Waikato University graduate, she is Managing Director of Te Matahiapo Indigenous Research Organisation. Her specialties and experience include inspiring leadership, Matauranga Maori working in partnership with western sciences, the arts, technology and spirituality, providing Women Only Retreats (Wahine Purotu), and international public speaking and workshop facilitation. As the daughter of the 10 tribes of Taranaki I acknowledge and honour the ancestral knowledge, the culture and heritage that has traversed the many planes of existence and which in this lifetime has been passed down to me from my tupuna. I view myself as “the new kid on the block” in terms of the world of art and creativity. It has been as recent as 14 months ago the the installation of my first work for public viewing called Pou Hihiri – The Womb of the Universe was included in the WAI exhibition curated by Ian Clothier in Albuquerque, New Mexico, USA at The International Symposium of Electronic Art 2012 (ISEA 2012). As a Maori woman I have discovered the magic and exhilaration of tapping into my spiritual, ancestral and genealogical roots, drawing on the wisdom and knowingness within myself. Also I acknowledge the traditional knowledge shared with me in the main by my kuia Amiria Rangi (now deceased), Tangiora Avery, Mereiwa Broughton and my father Dr Te Huirangi Waikerepuru. The result of their generous and open transferral of knowledge to me has been inspirational in terms of how I envision and portray Maori concepts and ideologies through a visual medium. This vision is carried by the passion and desire I have to ignite the expansion of universal consciousness amongst our global family towards a heart centred world view of renewal, healing, love and peace.